← Bonus Post: Food, Glorious Food! 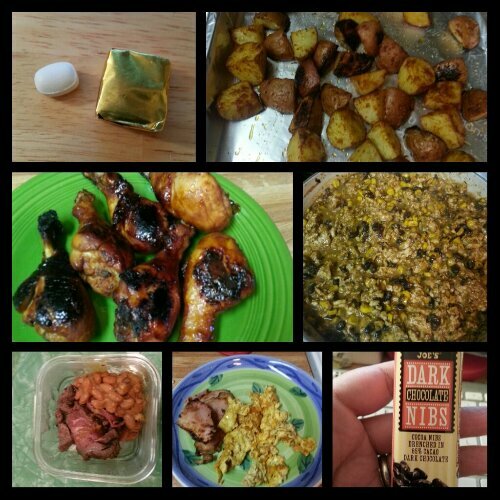 Today’s food choices, from upper left: multivitamin and calcium supplements x2; roasted seasoned red potatoes; chicken taco filling; Trader Joe’s dark chocolate nibs; scrambled egg with a side of Rudy’s smoked ham; Rudy’s smoked beef tenderloin and pinto beans; honey barbecue chicken drumsticks. Not shown: Applegate Farms chicken breast slices and Goldfish crackers. I decided this morning that I would track everything I ate and drank today so that I could avoid unplanned eating as much as possible. This worked until this afternoon, when my students were doing their population genetics lab in which we use Goldfish crackers and model the genetics of the population of crackers. We do this to study the Hardy-Weinberg equilibrium, a biological principle that basically says populations don’t evolve if certain conditions are in place for that population. It’s a mathematical modeling lab and the kids really dig it. I mean, they get to eat! And I do too, if I want to. Pre-surgery Me would have eaten a handful of crackers every class period, downing the equivalent to 6 servings of crackers. But I can’t do that now, and I don’t want to. So, I served myself a 2 ounce cup (the cup held 2 ounces, not that the crackers weighed that much) of crackers, counted them, logged them and ate them. After that, I was done eating them and didn’t want any more. But I won’t lie; it was hard to sit at my desk with a giant bowl of Goldfish crackers and NOT want to eat any of them. I’m going to give this new pre-eating and drinking tracking strategy a try this week to see how it goes and to see how it helps me cut back on my unplanned eating and helps me with my fluid intake. I figure this unplanned eating is a behavior I need to nip in the bud now while I am in weight loss mode so that I don’t make it a new habit especially once I get into maintenance long, long from now. It will also be nice to know what I’m going to eat every day, which will soothe some of the anxiety I sometimes feel about not knowing what I am going to feed myself that day. This entry was posted in challenges, daily bites, eating, habits, oh behave!, planning, post-op, vsg, weight loss surgery and tagged choices, daily bites, myfitnesspal, oh behave!, post-op eating, post-op life, she's got skillz, sorry for sleeve rocking, tracking, VSG, vsg realness, WLS, work that head game. Bookmark the permalink.